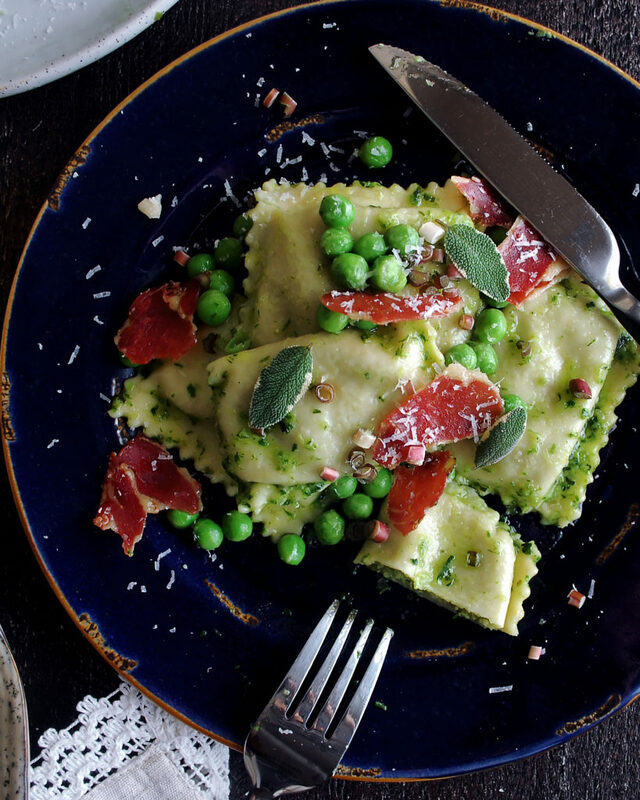 This agnolotti may just be my favorite dish of spring. Agnolotti is a shape of pasta, very similar to ravioli, just formed a little bit differently. I think I’ll definitely have to do a more visual post on how to form the pasta, because I realized that writing it out just doesn’t quite do it justice. 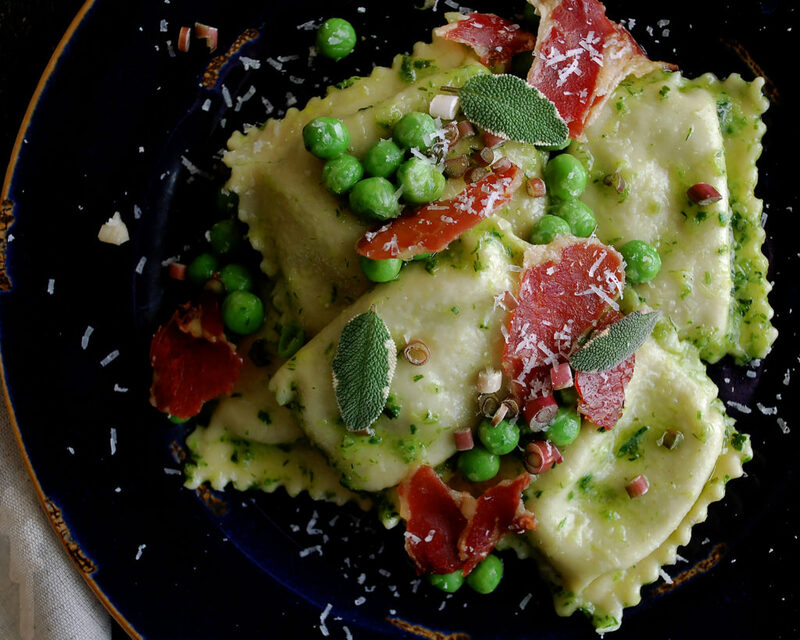 If you’re not familiar how to shape agnolotti, and can’t figure it out even with my best attempts to describe the process in the recipe, you can make these just like you would ravioli, for the time being. Anyways, let’s talk about this dish…it’s bursting with fresh, spring flavors and I honestly couldn’t stop eating it. I start by making fresh pasta dough. While the dough is resting, I work on all the other components of the dish. 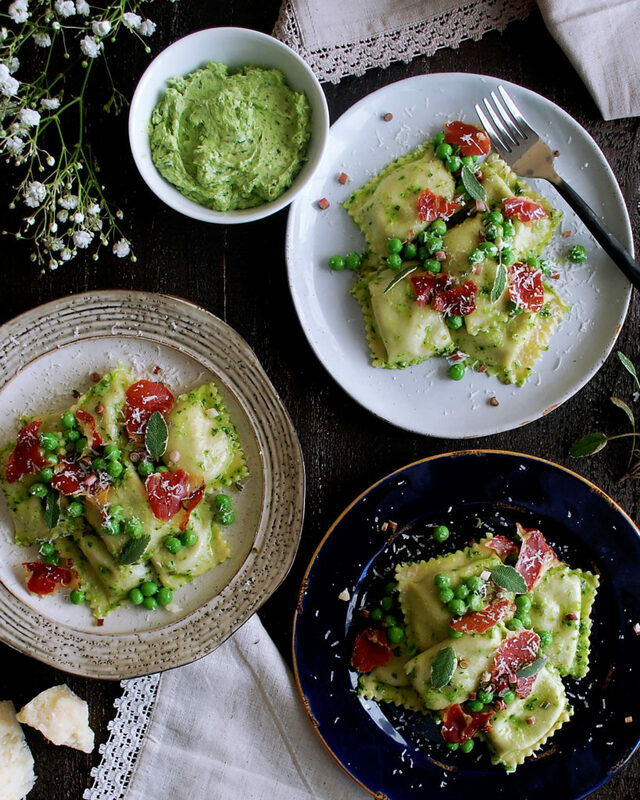 We’ve got a bright sweet pea and roasted fennel filling, a really simple ramp butter that makes anything taste good, and crispy coppa for the perfect, salty bite to finish the dish. For the filling, if you use fresh peas, you’ll have to blanch them first. Just bring a pot of water to a boil, add the peas for about 1 minute until bright green and tender, and transfer them to an ice bath to stop the cooking process. From here, they can be drained, dried, and used in the filling. 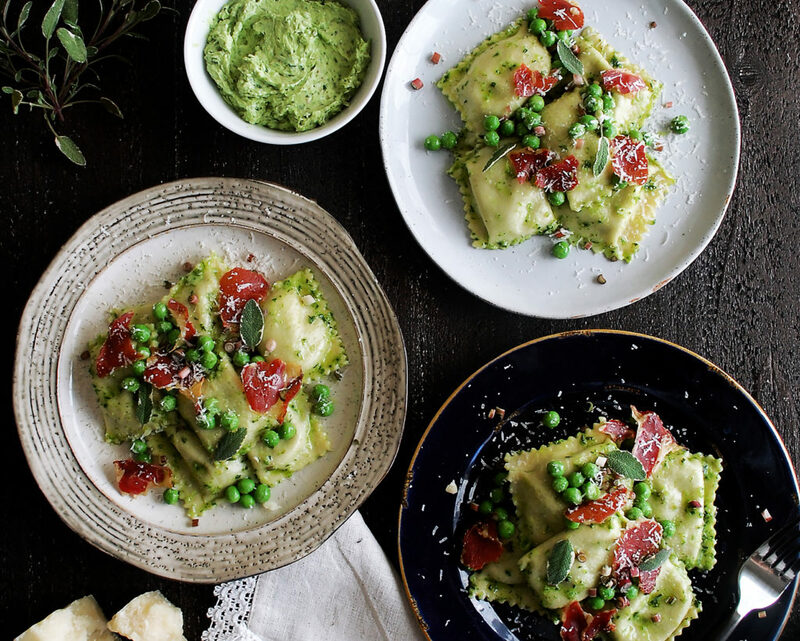 You can also use frozen peas. Just run them under water to defrost them before draining. The rest of the filling is simple, but has beautiful flavor from the lemon and parmesan cheese. Plus, the roasted fennel gives a nice, caramelized finish. I use ricotta cheese (whole milk) to give the filling a creamy texture. Make sure to taste the filling and adjust the seasoning if needed by adding more salt. 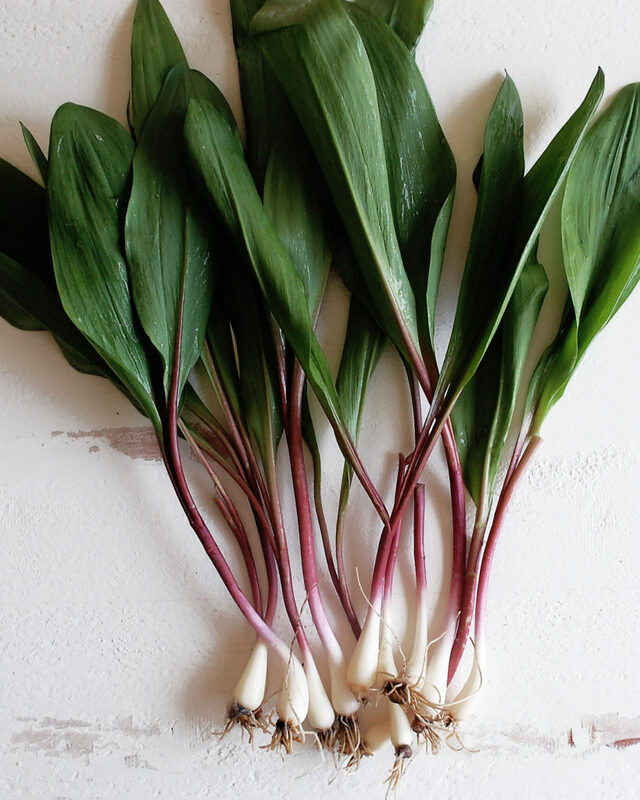 Ramps are one of my favorite spring ingredients to cook with. They have such a delicious flavor, sort of mild, falling right in between a sweet onion and garlic. Unfortunately, they don’t come around for too long, so you must utilize them while they’re out. 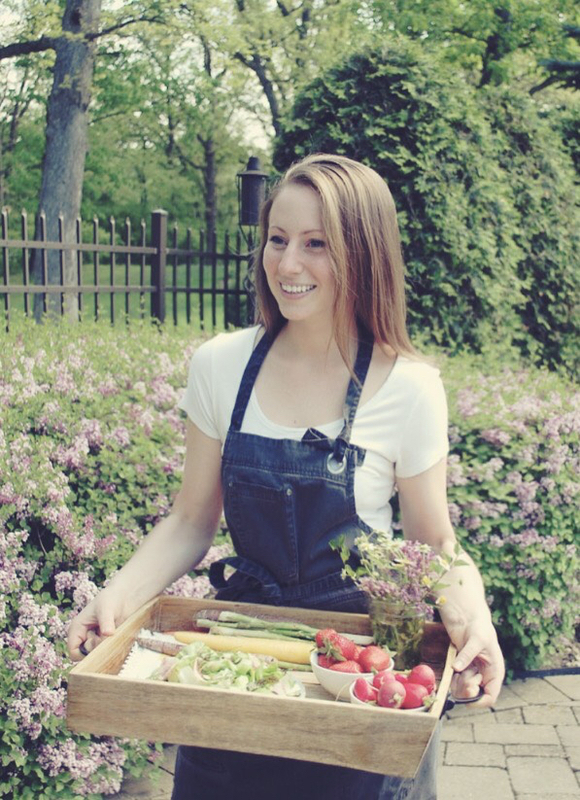 A lot of restaurants will preserve them by pickling to extend their use. I’ve chopped both the bottoms of the ramps and the tops and blended them into softened butter. This is really easy to do, but surprisingly adds so much flavor. The ramp butter also adds a beautiful bright green color to the finished dish. Once the agnolotti are done cooking, I gently toss them in the ramp butter. 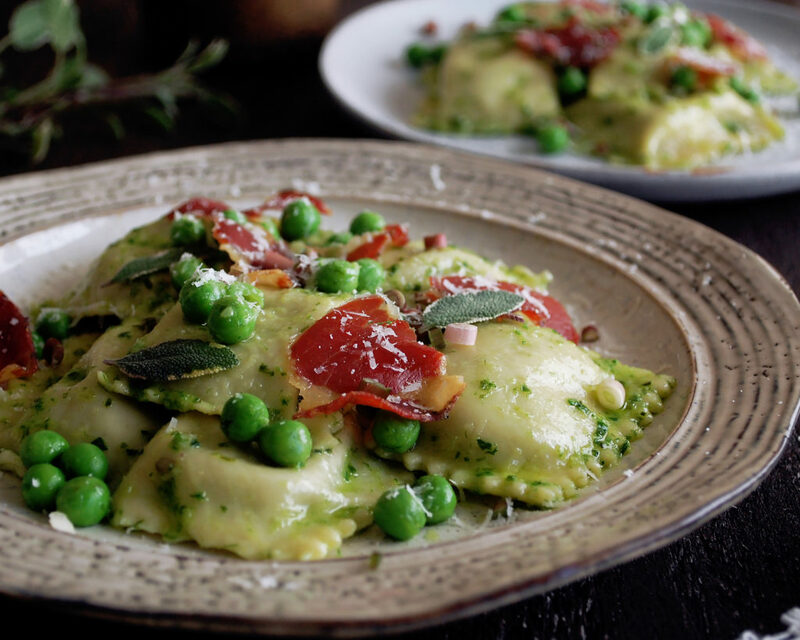 These little pillows of filled pasta get plated with a sprinkle of crispy coppa, a pinch of chopped ramp bottoms, a squeeze of lemon juice, and some freshly grated parmesan cheese. It is honestly spring pasta heaven. Enjoy! Measure the flour out in a large mixing bowl. Make a well in the center. Crack the eggs and egg yolks into the well. Add 2 tablespoons of water and a pinch of salt. Using a fork, begin to whisk the eggs, breaking up the yolks. Continue to whisk, pulling the flour into the center as you go. Keep working the mixture until a dough forms. You will most likely need to add the rest of the water, maybe more, to get the dough to come together. Once the dough is in the shape of a ball, turn it out onto a floured work surface. Knead the dough for 4-5 minutes. Form the dough into a tight ball, cover it in plastic wrap, and let it rest at room temperature for 1 hour. Heat a large sauté pan over medium heat. Add enough oil to coat the bottom of the pan. Add the sliced fennel and pan-roast until caramelized. The fennel should be tender and golden in color. Let the fennel cool. 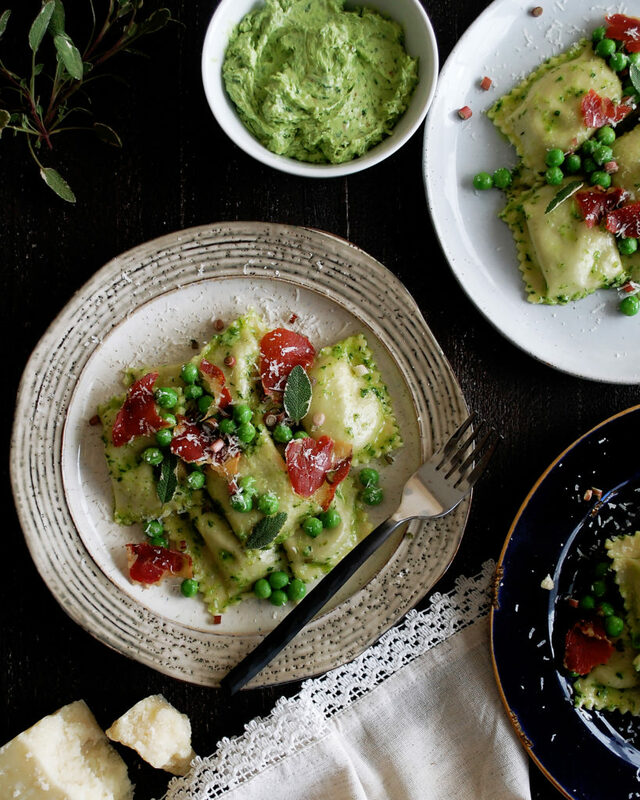 In a food processor, add the cooled fennel, peas, ricotta cheese, and lemon juice. Process until fully combined. Add the lemon zest and parmesan cheese. Pulse to incorporate. Season with salt to taste. Refrigerate until the pasta dough is ready. Add the softened butter to a food processor, along with the ramp bottoms and tops. Blend until fully incorporated. The butter should be bright green in color, with little specks of ramp throughout (no large chunks). Set aside until ready to serve. You will have some ramp butter left over. Refrigerate for another use. Preheat the oven to 300F. Lay the slices of coppa out on a sheet pan and bake for 20 minutes until crispy. Meanwhile, roll the pasta dough into thin sheets on a floured surface, cutting the sheets so they are manageable to work with. 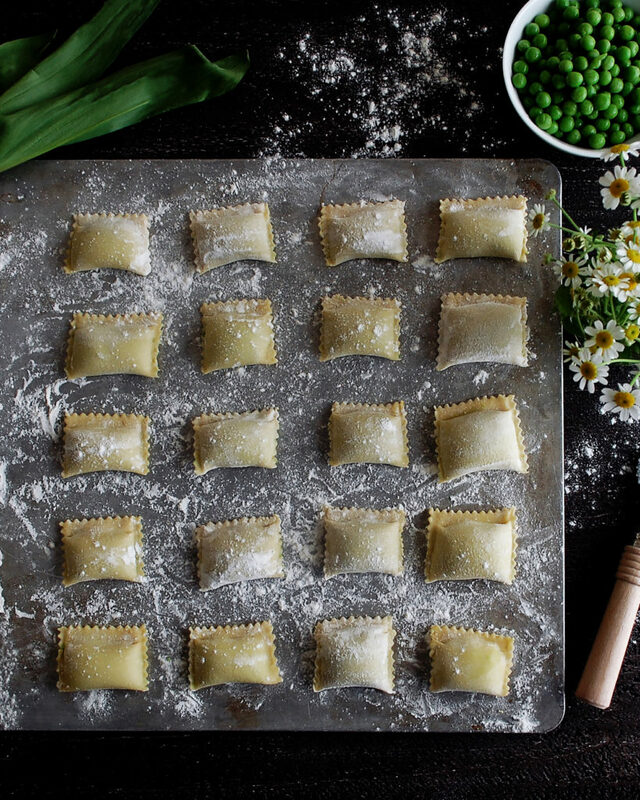 Fill a piping bag with the sweet pea and roasted fennel filling. Pipe a thick line of filling down the bottom side of one of the sheets, moving horizontally. Fold the topside over the filling and press out any air pockets, making sure the top and bottom sides of the dough form together. Use a thin roller (something with the shape of a pencil, or just use an actual pencil) to making indentations 1 inch apart down the filling, rolling back and forth to pinch down the dough. Make sure to create enough space between each shape so that you can cut the agnolotti without the dough popping open and filling coming out. 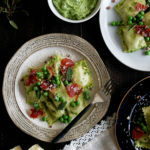 Once you’ve made the indentations, use a ravioli cutter to cut out each “lump” of filling into small little rectangular shapes, with one side folded over and one side pinched tight. Lay the agnolotti out onto a floured sheet pan. In a large pot of boiling, salted water, cook the agnolotti in batches. Once they rise to the top, they are done. Use a slotted spoon to gently remove the agnolotti onto a plate. To finish the dish, heat a few spoonfuls of ramp butter in a sauté pan (you may have to use 2 pans so you don’t crush the agnolotti). Once the butter has melted, add the agnolotti. Gently toss to combine or use a spoon to cover the agnolotti in the butter. Add the peas at the end to heat through. Spoon the agnolotti from the sauté pan to a plate. Break apart the crispy coppa and sprinkle on top. Finish with a pinch of ramp bottoms, a squeeze of lemon, a fresh grating of parmesan cheese, and a few sage leaves.